◎ The 19th Congress will be a watershed moment in the factional struggle between Xi Jinping and the Jiang Zemin faction. 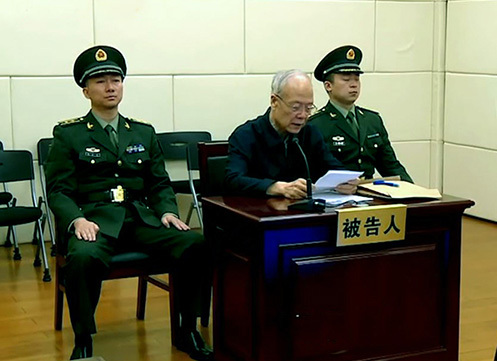 On Oct. 2, state broadcaster China Central Television (CCTV) aired episode five of an eight part documentary titled “Strong Military” that featured new clips of purged senior military officials Guo Boxiong, Xu Caihou, and Gu Junshan undergoing criminal prosecution procedure. The big picture: The airing of the documentary is the latest in a series of surprise moves by Chinese leader Xi Jinping ahead of the 19th Party Congress, the most important political gathering held every five years in which top Communist Party members are chosen and reshuffled to decide China’s socio-political policies over the next five plus years. On July 24, Chongqing Party secretary Sun Zhengcai, who was widely considered to be a future candidate to succeed Xi, was abruptly put under investigation. Between August and September, seven members of the Central Military Commission (CMC) were replaced, two of the seven were reportedly placed under investigation. On Sept. 15, the CMC dispatched four special discipline inspection groups to probe key military personnel. Military troops and domestic security personnel are reportedly being put on heightened alert from mid-September to mid-March 2018. Our take: By airing the confession statements by Guo and Xu, and highlighting recent high-level Party criminals, Xi is likely putting the Jiang faction, who we believe was planning a coup against Xi, on notice before the 19th Congress. The 19th Congress will be a watershed moment in the factional struggle between Xi Jinping and the Jiang Zemin faction. The losing side will eventually be completed purged.